Coarse crossbred wool growers have had some encouragement recently, albeit the recovering prices are coming off a low base. Signs of improvement are perceptible, though slight, especially given the strength of the New Zealand dollar versus the United States dollar. Renewed market activity, from India and China, drove this in the early part of 2018. This momentum has persuaded growers to shift wool, although crossbred wool returns remain barely sustainable. Passing rates are well back on what they were last year as growers are tending to meet market values. Lambswool prices have been strong, especially at the finer edge with market demand largely for wools 30 micron and finer. 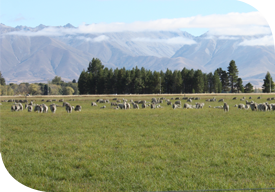 New Zealand halfbred and merino wool is currently out of its selling season, however prices in Australia remain very positive based on demand from the leisure apparel market and the Italian suiting sector. Also encouraging, we are starting to see more media commentary around the environmental sustainability of biodegradable woollen products. This is a positive for wool, given that there is more and more emphasis and knowledge on the risks and environmental challenges from plastics and synthetics. In the meantime, there remains a reasonable stockpile of crossbred wools, although this has diminished to a degree from earlier in the season. We are currently in the peak of North Island and Southland shearing seasons, creating a heavy flow of wool into store. Growers should continue to concentrate on their preparation standards. Where this has declined, the value of wool has been penalised compared to better prepared, better coloured wools.